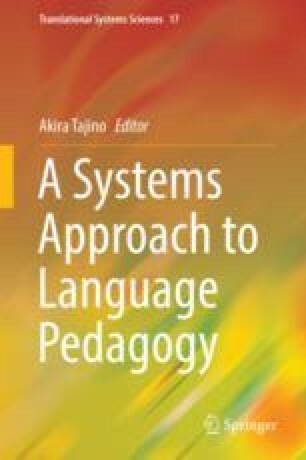 The purpose of this chapter is to discuss ways in which soft systems methodology (SSM) may be applied to the field of vocabulary learning and teaching. It begins by addressing the current problematic situation in this field and then attempts to approach the problem by borrowing the transformation processing model from SSM. In this chapter, I argue that teachers may benefit from focusing on fostering students’ vocabulary learning ability which contributes to effective vocabulary learning, rather than their vocabulary knowledge per se, because teachers typically do not have enough time to deal with vocabulary in class. I also suggest that vocabulary instruction should be seen as part of a broader language education system. More specifically, I propose that vocabulary and grammar instruction may be interconnected with each other within the framework of Meaning-order Approach to Pedagogical (MAP) Grammar, and explore ways in which vocabulary is learned effectively for communicative purposes using the MAP Grammar model. Biemiller, A., & Slonim, N. (2001). Estimating root word vocabulary growth in normative and advantaged populations: Evidence for a common sequence of vocabulary acquisition. Journal of Educational Psychology, 93(3), 498–520. https://doi.org/10.1037/0022-0663.93.3.498.